Universal try to launch their own Marvel style Cinematic Universe using their classic monsters starting with Alex Kurtzman’s The Mummy. By my count this is the third time Universal have tried to create a modern connected universe using their monsters with the first effort I, Frankenstein being a critical and commercial failure followed by a similarly dismally received Dracula Untold. I don’t actually mind either of those films; the aren’t great by any means but I was able to find some enjoyment in each of them and I think that Dracula Untold would have been a reasonable first entry into a shared universe. The interesting thing is that Universal almost created the Cinematic Universe concept decades ago with their famous monster movies. Actors, sets and characters would be shared between films without an awful lot of fanfare. It was just something that happened and gave those who watched all of them some kind of reward by way of fan service. Trying to replicate that should have been easy. I was actually baffled by how bad this film was. It makes the really stupid mistake of focusing on building the Cinematic Universe without focusing on the story that the title suggests. So much of the running time is spent on tedious world building and constantly winking at the audience with references to upcoming films while throwing constant awkward exposition at the viewer. Of course I’m not against a sly wink to the audience to set up another character or another film but there’s a good way to do it and a bad way to do it. The good way is to have the reference appear without slowing the narrative down and making it an organic part of the story; the bad way is to devote a large section of the film to explaining what might be happening in films that haven’t been made yet. That’s exactly what this film does and it’s laughable to witness. This film could be held up as a textbook example of how not to create a Cinematic Universe. Russell Crowe’s Dr. Henry Jekyll is the one shining spot in this tedious world building. He is the man in charge of the mysterious monster hunting organisation called Prodigium. They’re mysterious because most of what is said is cryptic and their motivations are so ill defined that there are direct contradictions in this very film. Jekyll is a character who doesn’t seem the same from one scene to the next but Russell Crowe makes what nonsense he has been given work. His Jekyll persona is impressively unhinged with the thin veneer of control and his Hyde is so off the wall that it’s a joy to watch. His presence doesn’t justify the tedium of having to listen to a lecture of what Prodigium is but at least there’s some entertainment to be had. 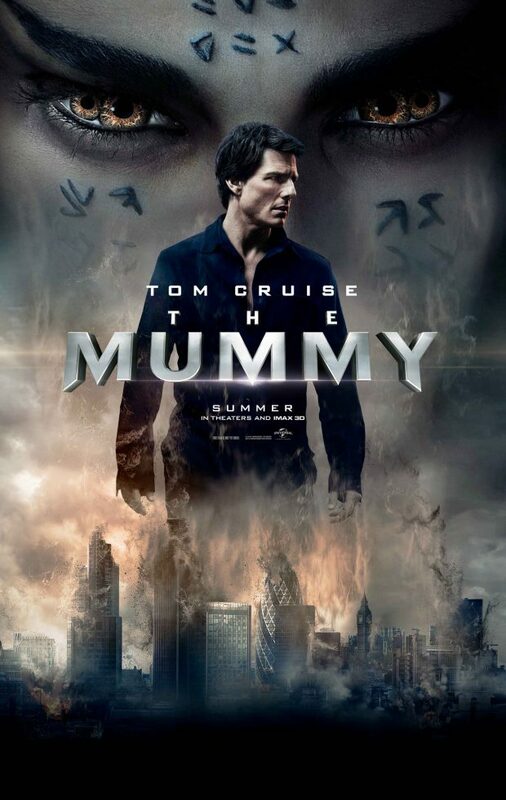 The actual Mummy story that gives the movie its title is completely uninteresting. Sofia Boutella plays the resurrected Egyptian Princess Ahmanet and is completely wasted with a by the numbers mystical villain character. Boutella is a really promising actress who deserves better material than this. Her motivations are clunky and undeveloped, there is no sense of who her character is and she doesn’t actually have an awful lot of screen time due to the time wasted on trying to hint at other films. Despite all that she does her best and projects the exotic/spooky vibe that defines her character brilliantly. There’s a good villain inside that performance but the script isn’t there to help Sofia Boutella achieve that. Her main opposition is Nick Morton (Tom Cruise) who might as well be called “some guy” for all his character is. I like Tom Cruise as an actor and think that he always does a good job in any film he appears but there is just nothing here for him. Nick is charismatic enough because he’s being played by Tom Cruise and there are some entertaining scenes but no time is spent letting the audience know who this character is or what he stands for beyond other characters telling him what sort of man he is. He’s told that he’s a “good man” but we don’t see much evidence of that in the events of the film and none of his decisions make sense because there’s nothing to suggest what inspires him to make choices. He’s effectively a blank slate at the beginning and ends the film the same way with the only forward movement being clumsy foreshadowing telling us that he will be important in some later film. Annabelle Wallis is also in this film as a generic love interest named Jenny Halsey. This character feels like she was put together from a list of character traits that people respond to. She’s intelligent, attractive, fiercely independent, fearless and compassionate. These all come out as the film goes but she never came across as any more than a collection of these characteristics which makes her impossible to invest in. I couldn’t even guess if Wallis gives a good performance or not because Jenny was inconsistent from scene to scene. The action sequences are equally underwhelming. At best they are bland an uninteresting and at worst they are so ineptly directed that figuring out what is going on is virtually impossible. It doesn’t help that the film takes a long time to get to them as it tries to tell its uninteresting story but there is certainly little in the way of reward for sitting through what passes for storytelling in order to get to an action sequence. It isn’t all bad. There is a plane crash sequence that is really well done. I wouldn’t recommend watching this film at all but if you get the chance to see this sequence in 3D then it is definitely a good example of how to craft a 3D sequence. It’s very brief but really impressive nonetheless. A textbook example of how not to establish a Cinematic Universe. This film spends far too much time on tedious world building and not enough on the story it should be telling. Russell Crowe is entertaining as Dr. Jekyll but there’s little else to say about the obscene winks and nods to other films that might be made. The actual Mummy story is completely uninteresting with Sofia Boutella doing her best at playing a villain character with unclear motivations and almost no development. Tom Cruise is equally wasted with a character who has nothing to him. He’s charismatic enough because he’s Tom Cruise but there’s nothing to his character. Annabelle Wallis plays a collection of characteristics that aren’t consistent from one scene to the next rather than a fleshed out human being. The action sequences are either dull or ineptly directed with the exception of a really impressive plane crash sequence that looks excellent in 3D. It’s not worth the price of admission just to see that but it is well put together.